The Budget and Finance Committee, which consists of a chairman and 3 other aldermen, conducts two very critical activities which must be accomplished each year. The Appropriations Ordinance is a very detailed list of estimated expenditures the City may need to operate throughout the year, and is based on each department’s submitted budgets. It may be inflated by 3 or 4 times. In addition, the committee formulates an internal working budget, and works within that budget throughout the year in order to keep it balanced. The Tax Levy must be submitted to the County Clerk's Office, and is typically a yearly increase of 5% of the estimated real estate taxes received by the City. The State of Illinois decides the actual amount received. The City Council has historically voted annually not to levy an increase greater than 5% to the taxpayers of Momence, as it searches for other avenues to fund the amenities the City offers. The link below indicates the most current monthly income and expense report as received from the City's accounting firm. Each report includes actual revenue received, expenses paid, and the Year-to-Date receipt/expenditure percentages of the annual budget for the fiscal year. 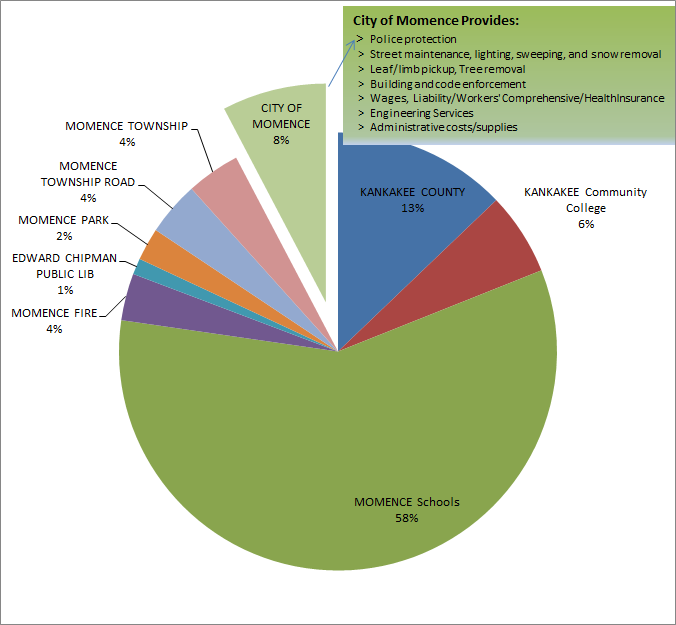 The fiscal year for the City of Momence is from May 1st through April 30th.